It had been raining for 5 days. Good news for transport by boat since there is more water in the rivers. Bad news for land travel, or rather ... mud travel. 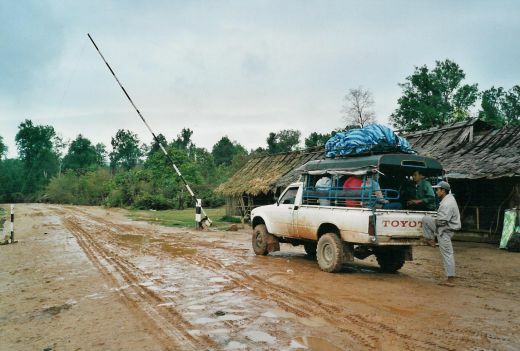 Two pick-ups cover the 200 km of dirt road between Huay Xai and Luang Nam Tha. In each vehicle, a dozen persons can squeeze on two face-to-face narrow hard benches. We were a few foreigners joining the locals for this trip : one israeli girl, two malaysian twin sisters, two corean blokes and two dutch girls. We left around 9.30 am, and after a few kilometers, the surface road stopped ... and the mud road started. Mud ahead of us for 200 km, mud splashing on the left and on the right, mud flying at the back. Sometimes we stopped in villages to pick up more passengers. They had to squeeze in and squat between the two benches, holding themselves on the knees of those sitting. During the stops, kids came to look at us with curiosity, but left promptly at the sight of a camera, then came back laughing, like in a game. Then we were back on our tortuous bumpy road, where any mud puddle could hide a hole. A couple of times, we thought we could get stuck : the engine was roaring, the wheels send more and more mud flying at the back and the pick up was loosing momentum, the started skidding. The driver stopped, but we always continued, to the relief of all passengers. Fortunately, the drivers were experimented and much more trustworthy than the idiot in a chinese bus who was racing with another. The fact that two cars were travelling together was also reassuring. We could only see the landscape through the space at the back that was not covered : the downpour, hills lost in the clouds, trees shrouded in mist, and always the same muddy road. The coming night added a menacing obscurity. Soon we could see the drops of rain in the dim red of the back light. We could barely make out the trees, like shadows in the fog and sometimes we caught the lights from the second pick-up at a turn of the road. We often passed across streams. We felt the front of the pick-up going down, then we heard water splashing, the back of the vehicle went down too and then the engine roared as we climbed out of the rocky river bed. The other pick-up was lower, less powerful and slower. In a steep section, its passengers had to get off and walk. We often stopped to wait for it. Our driver would stop the engine, turn off the headlights and we scanned the darkness of the jungle for a glimmer of light. The only noise was that of the rain. After 12 hrs, we reached Nam Tha, tired, but surely not as much as the drivers. Although uncombortable, this trip in good company was not too unpleasant. The day after, my Laos Visa expired and I left for China, in company of the malaysian twin sisters.